Synchronous Yoga brings yoga classes to you in your living room, while I teach you from my home studio using a video conferencing platform called ZOOM. You are part of a small collective and I lead you through seasonal practices. Some people might be in England, others in The Netherlands, while others in California. Synchronous Yoga offers so many advantages…. 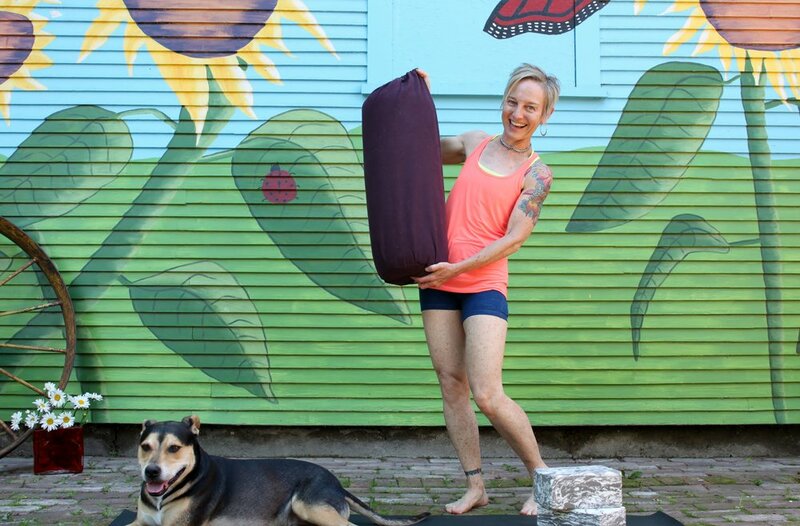 You can roll out of bed and be on your mat in 5 minutes, avoiding traffic, no need for baby-sitters, or to even take a shower. Classes are tailored to the group’s needs, and if/when those needs change within a season, I can modify to meet the groups evolving needs given my 18 years of teaching experience. Classes run 8 weeks during each season. If you have to miss a class because of travel or being sick, you can partake in class using the videos which are uploaded after each class. Every class is recorded and uploaded to a closed Facebook Group, of which you are invited to join. The FB Group allows continued connection with classmates in other places. With my years of teaching experience, I’m able to offer verbal adjustments online that are the next best thing to physical yoga adjustments. o You join an existing group or you can bring together a group of people who want to practice with me. o New groups and clients begin with a Zoom call to get set up.